For the budding singer, a karaoke machine gives them the spotlight to shine in. These are great products to have as they grow with your child, therefore they can be used years down the road. However, it is important that you find the right machine before making any purchase. 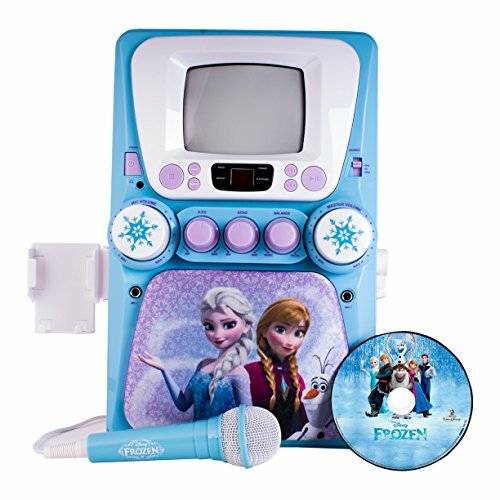 The best karaoke machine for kids should be simple for them to use, durable, and have a pleasing design. We looked at all these features and others to determine our top 10 list. Recommendation: As a frequent top seller, this Singing Machine product is dubbed by many as the best karaoke machine for kids. It features fun disco lighting that you can control in order to set the brightness of the ambiance. There’s Bluetooth connectivity to work with your phone or even YouTube, but it can be spotty at times. Also, consider buying different microphones as the ones with the machine are low in quality. 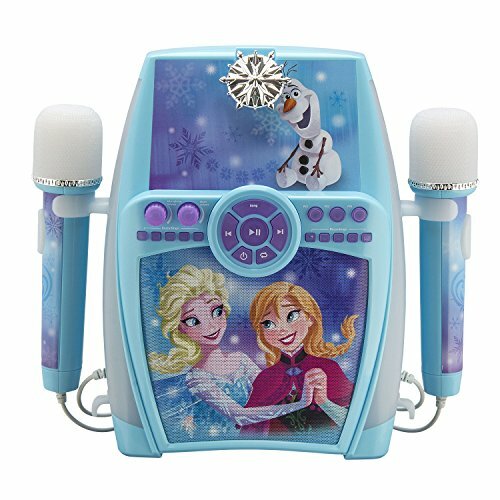 Recommendation: A good choice for young children thanks to the large, easy to understand buttons, this portable karaoke machine can be used either with batteries or plugged into the wall. It features an anti-skip design for the songs as well. The sound quality can still use some work though as it can come across as static-filled. This comes with two microphones, and even if the wires are short, it’s easy for kids to enjoy together. In case you have a baby and want them to be entertained you can pick one of these musical toys for babies. Recommendation: This next product on our best karaoke machine for kids list is a device built for imaginative play. It features a light show and even applause so your child can feel like they’re truly on stage. Kids can utilize these features with just stepping on the pedals. The Little Pretender comes with two microphones, but be aware that some reported one of them not working. With the adjustable stand, you can fit it simply enough to match your child’s height. Recommendation: Disney fans will take to this right away as it features a design of popular characters. The knobs are large enough for little ones to use on their own, and the vibrant lights make things even more fun. However, it does only come with two songs. Therefore, if you have a Smartphone, you can connect it to broaden the song choices. This fun machine may have microphone issues in which it can sound too low, so a replacement may be needed. Recommendation: The Kidzlane Kids Karaoke Machine comes with two sing-along detachable microphones and two expandable mic stands, so your child can enjoy this with others at the same time. This has three different dance beats, 2 sound effects: applause/booming, and disco flashing lights. It comes with an aux cable and can connect to your CD/MP3 player and to any smart devices while using 6 AA batteries that come with it. Moreover, it has a turning knob for microphone volume adjustment, it is fit for ages 3 and up, and the stands can expand up to 47 inches high. Recommendation: Another machine with an ever-popular Disney character design, this Frozen Disco Ball is sure to light things up. This can feel a bit low in quality, but it seems to hold up well with small children using it. There’s an option to attach another microphone, which can be helpful as the one it comes with may break. Moreover, it comes with a disco ball that guaranteed to ramp up any kid’s party. Recommendation: This karaoke machine is an all-in-one system, meaning it can do a number of things beyond the standard kid machines. You can stream from various devices and even input a guitar or keyboard. 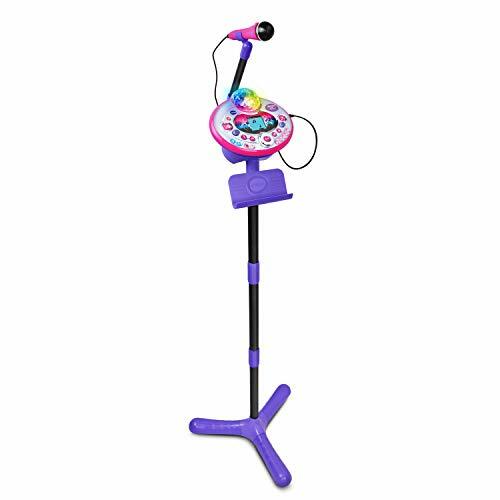 The Memorex SingStand is the best karaoke machine for kids looking for a more well-rounded system. Also, you can download for free different karaoke songs, and it has enhanced voice controls and an amplified speaker at the base. Recommendation: A fun, wireless karaoke machine is perfect for your child to take anywhere. It features bright, colorful LED lights that can be programmed to go along with the rhythm of the music. Controls are simple to use, but they’re positioned where you hold the microphone, so they might get in the way sometimes. The audio is prone to static as well, but when clear, it has a good sound. 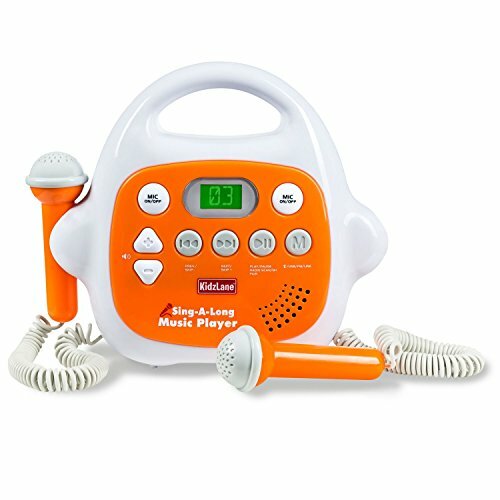 Recommendation: This portable karaoke toy for toddlers is compact and makes the perfect musical learning toy for a growing toddler. This toy is great as it features 15 cute kid-friendly sing-along songs, and four voice-changing effects while cool animations show the story of the lyrics. Moreover, it is also a learning toy as it introduces kids to letters and numbers, and is intended for kids aged 3 to 6 years old. Also, it comes with 3 AA batteries for the demo and a detachable strap for easy holding. Recommendation: We feel the best karaoke machine for kids is one that not only can they take on the go, but one that has a great battery life so they can enjoy hours of fun. This wireless microphone even has the option to connect to your device if you want to further save battery life. It can have some feedback and the echo can be much, but the overall audio is phenomenal. It’s lightweight and sturdy so kids have no problem playing with this. When you’re looking for the best karaoke machine for kids, you will want to remember to evaluate several features such as simplicity, design, and longevity. If you want to find other ways for your kid to develop skills and have fun you can check out this best board games for kids list. All of the systems in our list will work well for children, but feel free to let us know which one of these have you tried with your kids!